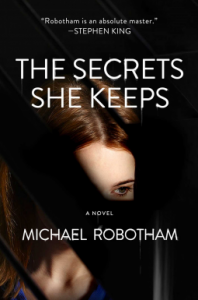 With its brilliant rendering of a shocking kidnapping plot and the secrets some women hold close, The Secrets She Keeps delivers a dark and twisted page-turner that is absolutely impossible to put down. My emotions were a whirl with this well thought out book. Though it was a bit length for the genre, this was a really quick read because of how gripping the plot was. I felt a real connection to both of the characters and emphasized with the way each of them felt. I became quite invested in the fate of all involved. The entire concept was incredibly well plotted and thought through. This was reflected in Agatha's character--she was precise and methodical. Meg had more going on than seemed on surface level which helped me to become quickly invested. I loved the details Robotham included and how they all tied together. The policework involved was also quite intriguing to read about. At the beginning, Agatha gave me the creeps, but flashbacks and pointed details really drew me to her and by the end, though I also wanted to shake some sense into her, I wanted to see her growing up a bit and being happy. The ending had a few surprises, including a relationship that I hadn't quite seen developing and a very solid finale. This was a rare book where the ending was quite satisfying in that I didn't want to read more about the characters because I knew enough to safely envision the rest of their lives. Though this book wasn't outstanding, it was enjoyable and very easy to get lost in.